You are here: Home / Jewelry / Yay or nay: pastel gemstone earrings. I love the chandelier part, but not the large stones in unmatched colors. Oh sure, why not? I mean, they’re kind of horrible but in a kind of wonderful way. Haha, I love that way of putting it. They definitely score major points for originality, and you know I love color. I think all my time in the queer community, hanging out with drag queens has totally raised my love of camp. That may be what I mean by “horrible in a wonderful way.” If there’s one thing I’ve toned down in my own dressing as I get older, it’s my campness… most of the time. I think there’s a lot to be said for style that’s unboring, whether or not I find it actually appealing myself. Does that make sense? I feel more joy from an outfit that is nutty but interesting than something blah and safe. 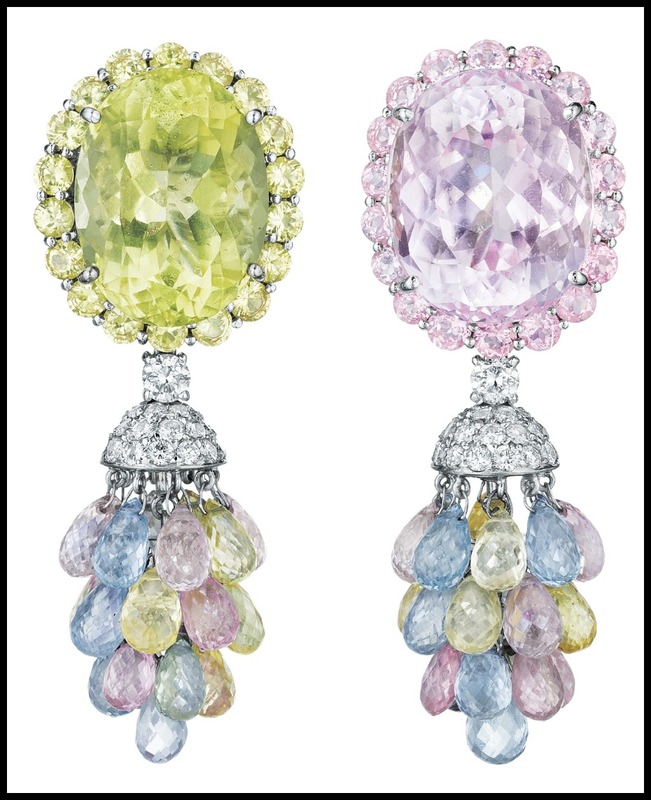 I agree with you on wanting to see richer jewel tones, but YAY for kunzite and the fun, mismatched color design! I don’t think the like/dislike answer is quite so simple – these really make you contemplate! Agreed. I love that they exist, and I find them delightful to look at, but they’re not a color scheme I would ever want them next to my face. However, that’s also related to my coloring. Someone with a darker skin tone than mine might be able to rock these pretty hard.